The late Gene Wilder quoted the first two lines of Arthur O’Shaughnessy’s poem Ode in Willy Wonka & the Chocolate Factory. Google happened to use that line in the audio for their Year In Search 2016 video (see below and bring a tissue.) Inspired, I decided to share the full poem. It’s fitting for the ending of a tumultuous year and anticipation that always builds with the beginning of the new. So here we are, one year ends and another begins. Keep loving. Keep fighting. Keep dreaming. And above all keep creating. The world needs your voice. Today is Christmastide, and I wanted to take a moment to extend holiday greetings to my readers. I hope you’re having a splendid day with your friends, family, pets, or the hushed whispers emanating from your closet. I want to thank you for supporting me and my work, for buying, reading, and reviewing The Bell Forging Cycle, and helping spread the word. I’m hard at work making more stories for you to enjoy, it’s going to be an interesting 2017. The artwork above was created by Les Edwards in 2007 and is entitled Christmas for Cthulhu. While the original artwork has sold, you can still buy prints from his site. He’s a fantastic artist and has an enormous quantity of work, see more pieces at lesedwards.com. I ran out of stickers (and buttons, actually) at Norwescon, which is great. I love that people love my swag, it’s why I make it. Plus, it allows me to expand the world of The Bell Forging Cycle beyond the page. However, I felt a few of the stickers were looking a little dated. They just weren’t as cool as the others, so since I ran out, I used this opportunity to refresh a few of the sticker designs. For those who aren’t familiar, stickers are available in my free swag packs, or you can get them by purchasing any book from my store, and of course all are available for free at conventions (along with a bunch of other stuff) as long as my stock holds out. Let’s take a look at the new designs! There have been two new updates with The Stars Were Right set, the St. Olmstead sticker has been completely redone and now includes the logo’s lockup. I’ve also added a new skeletal maero hand, taken from the mysterious Fig. 12. It’s very metal. The Old Broken Road sticker set got a pair of updates as well. This is the first time everyone is getting to see the City of Syringa seal. As with Lovat, Syringa is built upon the site of another city and there’s a reference to it in their seal. I’ve also included The City of Lovat Caravan Authority badge, the same mark that officially recognizes the Bell Caravan patches. Since Old Broken Road is about caravans I felt it was fitting. The Red Litten World sticker set is only six months old, so it doesn’t have any updates for 2016. But I love it, and its awesomeness is a big reason why I felt like I needed to update the previous sets. Plus I wanted to include it in this post so you can see all sets side by side. Thoughts? Judgments? Hatred? Why not leave a comment below and tell me what you think? It’s January 1st. The new year is finally upon us! Here’s wishing a fantastic upcoming year to you and yours. As I said at Christmas, thanks for all your support. I can’t wait to see what this fresh year brings, new travels, new books, new conventions… there’s a lot to look forward to in 2016. For your enjoyment, here’s a postcard from the Victorian era featuring a potato wearing a hat and boots holding an umbrella and wishing everyone a Happy New Year. What a jaunty and thoughful fellow! 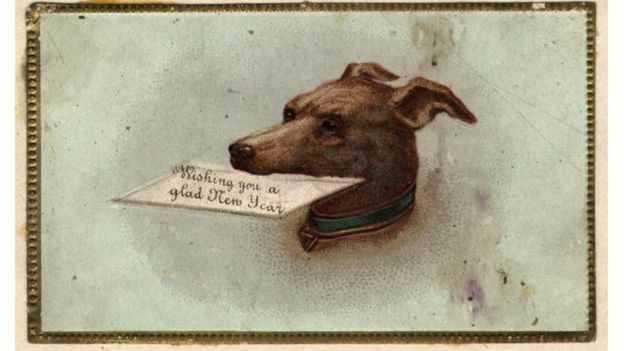 Now, if that didn’t quite satisfy your new year helping of strange, feel free to check out these other postcards. Featuring a picture of a cat with glasses in a bonnet, a floating dog head delivering greetings, or a bug using a telescope to look at the moon. You know, seasonally appropriate festive stuff. The Victorians were a weird people.